LOSELY related to the gentler forms of the sublime is Ruskin's conception of the "noble picturesque," which he presents in the fourth volume of Modern Painters. Several times in the course of his writings he attempts to explain the nature of what he felt to be a uniquely [220/221] modern aesthetic category characteristic of a uniquely modern style and subject matter in painting. In The Seven Lamps of Architecture he remarks upon the fact that signs of age appear pleasing to men, and that since the Renaissance, schools of art have arisen which concentrate upon such signs of age, thereby impressing upon "those schools the character usually and loosely expressed by the term 'Picturesque.'" Proposing to examine the nature of this art, he first points out that "probably no word in the language, (exclusive of theological expressions,) has been the subject of so frequent or so prolonged dispute; yet none remain more vague in their acceptance" (8.235). Here he may be referring to the Knight-Price controversy or, more likely, to the various definitions and usages of the term "picturesque" he had encountered in contemporary art periodicals and in the conversation of practitioners of the picturesque, such as his drawing masters J. D. Harding and Copley Fielding. Just how much Ruskin knew about the three main theorists of the picturesque, William Gilpin, Richard Payne Knight, and Uvedale Price, remains unclear. Although his frequent discussions of this term never mention any of these writers, typescripts of his notebooks in the Bodleian mention "Sir Uvedale Price on Picturesque"(Bodleian Library, Oxford, Eng. misc. c. 218. ), but it is unclear whether he had read this or merely planned to. Ruskin, who had read Knight's work on mythology, may also have known his essays on the picturesque, though there is no indication of this, and of Gilpin there exists no evidence that he knew his writings. Far more important to Ruskin were his conversations and lessons with Fielding, Harding, and Prout, three painters, according to him, who were among the ablest and most important practitioners of this mode of art. His example of the rugged cottage roof reveals that the picturesque is a reduced form of the sublime which possesses its sharp oppositions and asymmetry without the large scale necessary to create impressions of grandeur. Since the irregular variety, which Ruskin takes to be the chief distinguishing mark of the picturesque, lacks any dominant unity, it does not partake of the beautiful; since it lacks vastness, it cannot produce the powerful emotions of the sublime. Depending in part on "resemblance or association"(8.237) of things sublime, the picturesque produces a minor form of delight. From this passage and others in which he describes the nature of the picturesque, one can conclude that Ruskin believes it is created by an irregular variety which characterizes a painting's line, lighting, color, and composition. This irregular variety, or "ruggedness" as he most frequently terms it, leads the artist in search of the picturesque to depict objects, such as ruins or rustic cottages, which provide rough, pleasing texture. Having chosen such subjects, the artist will then avoid the open, clear light which Ruskin advocated in his remarks on the beauty of infinity and will, instead, [224/225] employ strong shadows in the manner of "Rembrandt, Salvator, or Caravaggio" (8.237). Like these artists, the man in search of the picturesque uses shadow not primarily to depict an object, but as a subject in itself. In other words, the picturesque, a distinctively minor mode of art, uses the creations of man and nature to display technique, rather than employing the artist's skill for further ends. The delight created by a skillful treatment of line and shadow surmounts any potential delight in the objects depicted. Ruskin, who frequently characterizes Harding's work as picturesque, agrees with his emphasis upon irregularity and variety. On the other hand, he does not accept his teacher's notion that "the wildness of nature is picturesque simply," and he several times mildly censures him for sacrificing the beauties of nature to the lesser asymmetries and irregularities of picturesque art. In the first volume of Modern Painters, for instance, even as Ruskin presents his friend's work as an example of excellence, he adds that "Harding's choice is always of tree forms comparatively imperfect, leaning this way and that, and unequal in the lateral arrangements of foliage. Such forms are often graceful, always picturesque, but rarely grand; and, when systematically adopted, untrue" (3.60l). Whatever his reservations, Ruskin had learned this conception of nature and the stylistic mannerisms necessary to achieve it in art from Harding's drawing lessons and published works, and from the sketching tours they took together. Ruskin, however, first learned to appreciate the picturesque, not from Harding or Copley Fielding, his other drawing teacher, but from the works of Samuel Prout. In the catalogue he wrote for the exhibition of the artist's works at the Fine Art Society (1879-1880), he described how one of Prout's drawings which "hung in the corner of our little dining parlour at Herne Hill as early as I can remember . . . had a most fateful and continual power over my childish mind. . . . In the first place, it taught me generally to like ruggedness; and in the conditions of joint in moulding, and fitting of stones in walls which were most weatherworn, and like the grey dikes of a Cumberland hillside" (14.385). 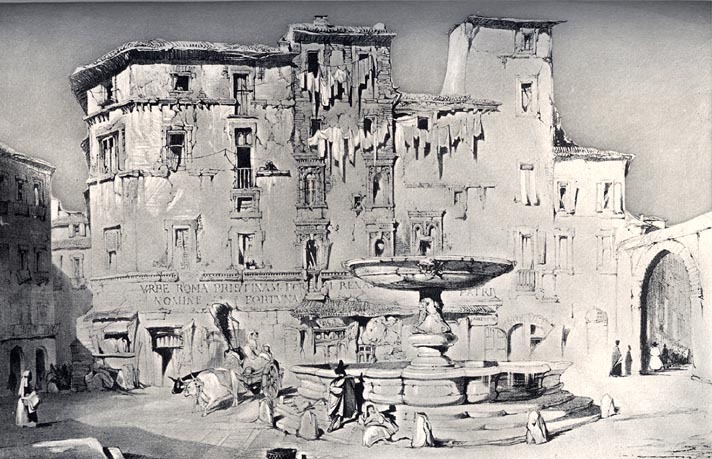 This love of picturesque ruggedness appears clearly in Ruskin's own drawings, many of which [226/227] surpass his model. The first volume of Modern Painters explains that "the reed pen outline and peculiar touch of Prout, which are frequently considered as mere manner, are in fact the only means of expressing the crumbling character of stone which the artist loves and desires" (3.194; see Plates 17-18), and Ruskin's own pencil drawings of architectural subjects emulate the older artist's style to create similar effects. And like Prout's drawings, many of his own attempt to portray "the knots and rents of the timbers, the irregular lying of the shingles on the roofs, the vigorous light and shadow, [and] the fractures and weather-stains of the old stones" (11.160). For example, Ruskin's drawings done when he was sixteen years old clearly emulate Prout's studies (illus. facing 1.8), and as he began to lay in washes and depict shadow more completely his works increasingly resemble the older artist's more finished drawings (illus. facing 14.426). Ruskin, on the other hand, never tried to rival Prout's placement of figures, one of the painter's skills he most admired, and, furthermore, since many of his own architectural subjects are delightfully incomplete sketches, they rarely rival the painter's larger works. Although his landscape drawings show the clear influence of his teachers and Turner, the pictures of architecture remain indebted to Prout. Part of Prout's accomplishment in creating picturesque depictions of noble buildings lay in his ability to present the effects of age and human life upon his subjects. Until Prout, says Ruskin, excessive and clumsy artificiality characterized the picturesque: what ruins early artists drew "looked as if broken down on purpose; what weeds they put on seemed put on for ornament" (3.216). To Prout, therefore, goes credit for the creation of the essential characteristics lacking in earlier art, in particular "that feeling which results from the influence, among the noble lines of architecture, of the rent and the rust, the fissure, the lichen, and the weed, and from the writings upon the pages of ancient walls of the confused hieroglyphics of human history" (3.2l7). Prout, in other words, does not unfeelingly depict signs of age and decay chiefly for the sake of interesting textures, but rather employs these textures and other characteristics of the picturesque to create deeply felt impressions of age nobly endured. In addition, Prout advanced this mode of art beyond concentration on the "minor elements of the picturesque, — craggy chasms, broken waterfalls, or rustic cottages" (13.368). Ruskin once wrote that if Turner "had only wanted what vulgar artists think picturesque," any English valley would have provided him with an endless supply "of old tree trunks, of young tree-branches, of lilied pools in the brook, and of grouped cattle in the meadows" (13.437). Neither Turner nor Prout were vulgar artists, and while Turner concentrated upon the infinite beauties of nature, Prout, more interested by the cityscape, redeployed aspects of picturesque technique to show the effects of men and time upon noble works of architecture. In the first volume of Modern Painters Ruskin insists that the pleasure we receive from the signs of age that Prout includes in his work distinguishes our delight in his art from "mere love of the picturesque" (3.2l7), and this distinction between "age mark"(3.207) and the conventional picturesque becomes, in the fourth volume, the Ruskinian opposition of the surface and Turnerian (or noble) picturesque. An examination of the reasons which lay behind Ruskin's continuing suspicion of the conventional picturesque reveals much that characterizes his theories of art. In the first place, he believes that "the modern feeling of the picturesque, which, so far as it consists in a delight in ruin, is perhaps the most suspicious and questionable of all the characters distinctively belonging to our temper, and art" (6.9). 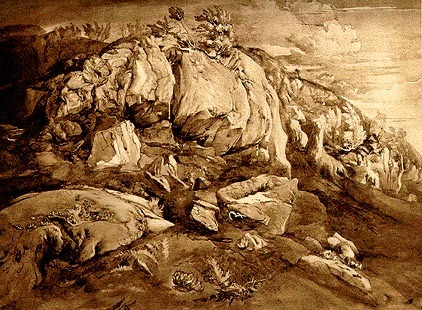 This lesser mode of the picturesque not only neglects the higher forms of the beautiful to portray broken rocks and thatched roofs, it also, by its natural concentration on ruin, encourages the artist and spectator to delight in sad, painful things for the sake of interesting lines and colors to the neglect of the human significance of the scene depicted. Thus, "in a certain sense, the lower picturesque ideal is eminently a heartless one" (6.19), for artists unthinkingly and unfeelingly create images of broken-down windmills and weakened men because they have visual interest. visionary intensity as it reveals the beauties present in mundane, everyday reality. In The Stones of Venice Ruskin wrote that the "whole function of the artist in the world is to be a seeing and feeling creature; to be an instrument of such tenderness and sensitiveness, that no shadow, no hue, no line, no instantaneous and evanescent expression of the visible things around him, nor any of the emotions which they are capable of conveying to the spirit which has been given him, shall either be left unrecorded, or fade from the book of record" (11.49). The lesser mode of the picturesque, however, necessarily reduces the artist to a seeing creature, forcing him to ignore the emotional — human — implications of his subject. This form of art, which requires an unhealthy dissociation of faculties in the artist, can only appeal to the aesthetic sensibilities of fragmented modern man. An example of the immoral abstraction implicit in the lower picturesque appears in Sir Charles Bell's Anatomy and Philosophy of Expression in the Fine Arts, which Ruskin several times quotes in his Modern Painters: "In Roman Catholic countries the church-door is open, and a heavy curtain excludes the light and heat; and there lie about those figures in rags, singularly picturesque" (6th ed., London, 1872, p. 16). Uvedale Price relates an anecdote which can serve as a parable here: One day when Reynolds and Wilson, the two painters, were looking at a scene, Wilson tried to point out a particular detail to his companion. "'There,' said he 'near those houses‹therel where the figures are.' — though a painter, said Sir Joshua, I was puzzled. I thought he meant statues, and was looking upon the tops of the houses; for I did not at first conceive that the men and women we plainly saw walking about, were by him only thought of as figures in a landscape" (An Essay on the Picturesque, 379n). For Ruskin, [230/231] taking delight in figures in rags corrupted the artist and audience alike. All exquisitely picturesque, and as miserable as picturesque. We delight in seeing the figures in the boats pushing them about the bits of blue water in Prout's drawings, but, as I looked to-day at the unhealthy face and melancholy, apathetic mien of the man in the boat, pushing his load of peats along the ditch, and of the people, men and women, who sat spinning gloomily in the picturesque cottages, I could not help feeling how many suffering persons must pay for my picturesque subject, and my happy walk. (Diaries, II, 493; Ruskin quotes this passage with slight changes in phrasing as a note to the chapter on the Turnerian picturesque (4.24n). Ruskin's bitterly ironic presentation of this Highland scene simultaneously exposes the implications of the picturesque and, as Rosenberg has pointed out, reveals "the insufficiency of the Wordsworthian view of nature" (23). The passage possesses a unique interest for a student of Ruskin's notions of the sister arts, for it shows him utilizing his own great skills at literary pictorialism rather differently than he had in earlier volumes of Modern Painters. Ruskin's usual practice, particularly in his first volume, is to create a word painting which he then frequently uses as a standard for judging a pictorial representation of a scene. In the opening volume of Modern Painters, he creates a powerful image of nature's colors near the Italian town of La Riccia to show how far from this splendor the older painters of landscape remain (3.277-279). The final volume of Modern Painters, in contrast, uses such literary pictorialism, not to show that nature is more beautiful than art, but to present the ugliness that a sentimentally artistic vision of nature conceals. The result has been, as he earlier pointed out, that the "picturesque school of art rose up to address those capacities of enjoyment for which . . . there was employment no more.... And thus the English school of landscape, culminating in Turner, is in reality nothing [236/237] else than a healthy effort to fill the void which the destruction of Gothic architecture has left" (11.225-226). Ruskin offers several solutions to the problems created by the modern city. First of all, he wishes to extend the influence, the enriching effects, of the art of Turner and other painters of landscape; secondly, he encourages his audience to revive a healthy mode of architecture, one which would provide the necessary stimulus for the minds and spirits of men; lastly, he tries to change the economic system which has led to such monotonous environments. One important way to extend the influence of great artists like Turner is to educate the audience to appreciate the higher, or noble, form of the picturesque. In contrast to the "surface-picturesque" (6.16), which dwells on texture at the expense of emotion, the noble picturesque is produced by "an expression of sorrow and old age, attributes which are both sublime" (6.10). In other words, since the "higher condition of art . . . depends upon largeness of sympathy" (6.19), the noble picturesque, the form practiced by Turner, arises, not from neglect of the meaning of the scene depicted, but from concentration upon it. It is produced, then, by expression "of suffering, of poverty, or decay, nobly endured by unpretending strength of heart. Nor only unpretending, but unconscious. If there be a visible pensiveness in the building, as in a ruined abbey, it becomes, or claims to become, beautiful; but the picturesqueness is in the unconscious suffering" (6.14-l5). The noble picturesque, a form of the gentler sublime, is an associated, subjective aesthetic pleasure which demands the projection of human characteristics upon old buildings. Indeed, old buildings are to be considered as old, noble men. Much of this sad, pathetic sublimity is created by age. In the first volume Ruskin had written of the beauties of age itself, and these are apparently part of the sublime emotion which creates the noble picturesque: "There is set in the deeper places of the heart such affection for the signs of age that the eye is delighted even by injuries which are the work of time; not but that there is also real and absolute beauty in the forms and colours so obtained" (3.204). 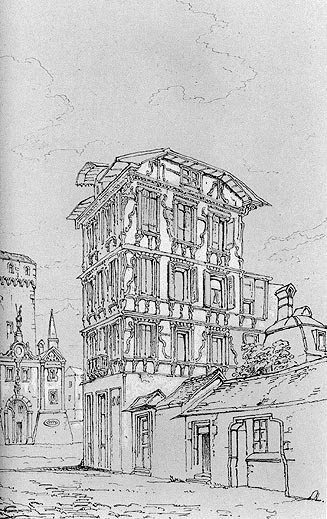 Even at this early period Ruskin distinguishes this pleasure from what he later called the surface-picturesque; for he remarks that although a building may have "agemark upon it which may best exalt and harmonize the sources of its beauty," our enjoyment of this sign of aging "is no pursuit of mere picturesqueness; it is true following out of the ideal character of the building" (3.207). This distinction between age-mark and mere picturesqueness became, in the fourth volume, the distinction between the noble and lower, or surface picturesque. There are good reasons for taking Ruskin's definitions of the noble picturesque as the final and representative statement of his aesthetic position. The picturesque, in some sense, is a combination of the sublime and the beautiful and is midway between them, a reduced, gentler, less exalted form of both. And as an intermediary class it reminds us of Uvedale Price's idea that the picturesque should bridge the sublime and the beautiful. (According to Price, "Picturesqueness appears to hold a station between beauty and sublimity; and on that account, perhaps, is more frequently, and more happily blended with them both, than they are with each other." Price, An Essay on the Picturesque, 82.) In this last major statement of his aesthetic [238/239] position, Ruskin tried to formulate a description of that kind of pleasure which he thought most characteristic of the art of his contemporaries, and in so doing he shows his close relation to theorists of the late eighteenth and early nineteenth centuries. Like them, after he had been concerned with the most violent aspects of the sublime, and the most tranquil forms of beauty, he presented what was in effect a third aesthetic category which emphasized calm, more tranquil, yet subjective effects. Ruskin's statements about the picturesque are also characteristic, not only because he related it to an aspect of the contemporary sensibility which troubled him, but because he here most fully accepts an aesthetic which is patently subjectivist and associationist. This change reflects the changes that were going on, or were being prepared for, in Ruskin's thought as he turned increasingly toward the problems of modern man in modern society. The new humanism which fully appears in the last volume of Modern Painters is presaged by the picturesque which gains its effect not, as with beauty, from a figuring forth of divine qualities, but from human associations. Ruskin's description of the picturesque, which at so many points contradicts his ideas of beauty, shows how difficult it had been for him to maintain that his beauty of order contained the pleasures most suited to the art of his time. Ruskin had at first denied the sublime the dignity of a separate aesthetic category, but after formulating his theories of beauty, he found it necessary to use sublimity to contain a wide spectrum of aesthetic effects. The picturesque, which is a subcategory of the sublime, is the final expression of this inability to maintain a classicistic theory of beauty.